The Lower Cascade Falls trail is located in Ouray, Colorado. The trail is accessible from a trailhead at the east end of 8th Avenue as well as a trailhead higher up the mountain across from the Amphitheatre Picnic Area. Thousands of visitors every year hike to the falls from the lower trailhead on 8th Avenue which only requires about a quarter mile round trip of effort. 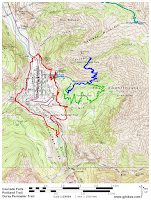 Beginning at the upper trailhead involves a steep descent down the mountainside of about 400 feet over the distance of about a half mile which of course must be climbed once again to get back to your vehicle. Since beginning at the 8th Avenue trailhead doesn't require much of a description we will begin at the upper trailhead for this post and add the other starting point in at the end. To get to the upper trailhead drive south out of Ouray as though you were headed up Red Mountain Pass. After about a half mile turn left at the sign for the Amphitheatre Recreation Area. Follow the road for about 1 mile to the picnic area. There is a pipe gate across the road just past the picnic area that is locked whenever the campground is closed for the year. While there isn't a restroom at the trailhead there is one across the road at the picnic area. From the upper trailhead the route passes through the conifer forest in the direction of town and the falls. The hiking is easy and very pleasant. It wouldn't be unheard of to spot a deer or even a bear along the way. If you just can't wait to see the waterfall there are a couple of places where you can walk over to the edge of the mountain and catch a glimpse over the trees of the upper cascade. For the first quarter mile from the upper trailhead the descent is gradual and easy. 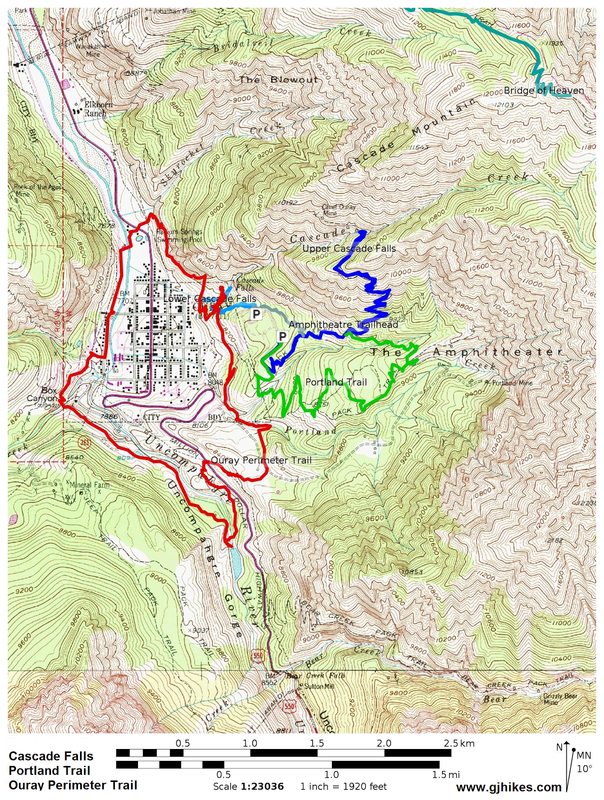 At that point the Lower Cascade trail combines with the Ouray Perimeter trail with which it shares its route with all the way to the falls. For the next quarter mile the trail becomes much steeper although it has been rerouted so that it isn't nearly as steep now as it was 10 or 20 years ago. Be sure and not cut across any of the switchbacks or use any of the old sections of the trail so that the erosion can be kept in check and the old trails can be reclaimed. At the base of the hill you have the option of hiking up the east side of Cascade Creek to look at the falls or cross the bridge and hike up the west side of the creek. The trail on the west side of the creek is probably a little easier especially if you want to get close enough to feel the spray of the water. The waterfall runs much heavier during the spring and early summer months than it does in late July and August. This picture was taken in late July and while we were there we noticed that the water was actually flowing in surges. This is the sign that greets you if you park at the lower trailhead at the end of 8th Avenue. At present there are several picnic tables near the lower trailhead but not any restrooms. For those that can't manage the last stretch of rocky trail to get up to the falls there is a kiosk where they can sit and admire it from. The trail between the parking area and the kiosk isn't rated ADA accessible but with a little help someone might be able to manage it with a wheelchair. There is a short rocky section that you might want to take a look at before giving it a try. Now all you have to do is climb back up the mountain to get back to your vehicle. Nothing says that you have to see how fast you can make it unless that is your idea of having fun. The forest is pretty and you will get more chances to see some wildlife. There were 30-40 vehicles packed in at the lower trailhead but the most we saw at the upper trailhead at one time were 3 and the occupants of 2 of them were hiking the Upper Cascade Falls trail which can also be accessed from here via a short connector trail. If all you want to do is the typical tourist thing and see the Lower Cascade Falls with the least amount of effort then find your way to the trailhead at the east end of 8th Avenue and begin from there. If you are looking for something a little more adventurous then drive up to the Amphitheatre Picnic Area to start your hike. (We actually hiked the Upper Cascade Falls trail, the Portland trail and the Lower Cascade Falls trail all on the same day but then again we hike a lot more than most folks do.) If you would like to see it for yourself then all you have to do is 'Take a hike'.